Over the first three months of 2013, our sources have shown instances of stage 1 (Classification) and stage 4 (Polarization) of Gregory Stanton’s 8 stage model of the genocidal process. The January report commentary highlights a resurgence in international awareness regarding the repression of Bahá’í, but express some skepticism over what the cumulative impact this awareness will take given the priority given to national security concerns. This month’s commentary also reflects on the historical resilience of the Bahá’í but warns that this may create a vicious cycle in tandem with the Messianic edicts of Islam which views the existence of so called religious infidels as confirmation of religious prophecies and the justification of violent response. Recommendations include monitoring and prevention efforts focusing on any subtle yet significant shifts in anti Bahá’í persecution given its historical course in Iran. The behaviour of the Iranian regime was observed to be carrying out a geopolitical gambit of cementing regional ties and appearing as a non-aggressor with respect to their nuclear program. A resurgence of the cyberwarfare issue was observed in the month of February. The revealed existence of multiple unused variants of the sophisticated stuxnet worm raised our concerns that that this would give the Iranian regime due cause to re-double their monitoring and surveillance of civil society as well as restricting their digital borders. The Stuxnet worm was a sophisticated cyber attack that was successfully designed to cripple nuclear centrifuges in Iran. It was re-emphasized in this report how this is just another example of how the humanitarian agenda has been an unseen casualty of the national security and realpolitik agenda in both the Middle east and the West. The request for international recognition by the opposition in Iran, offers an interesting parallel with the crisis unfolding in Syria. Despite the contrast in the level of outright violence occurring in both countries, the plight facing opposition movements are similar and the political course, interests and fate of both countries are firmly intertwined. 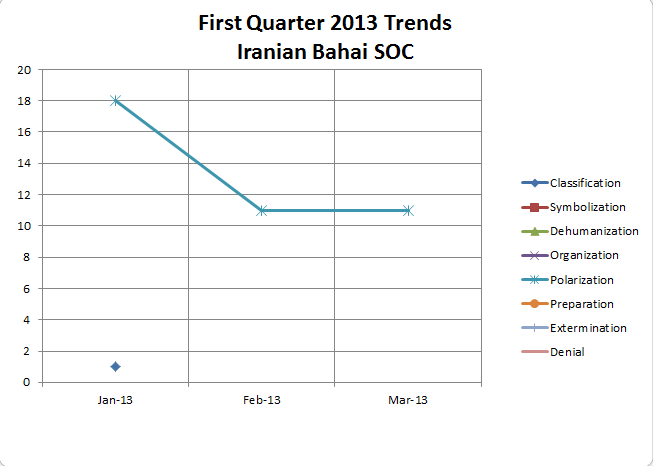 New Research Analyst Neekoo Collett lends her analysis to the events facing Iranian Bahá’ís in March of this year. Collett’s analysis highlights arbitrary arrests, and the denial of education for Bahá’ís. Historical milestones sanctioning the monitoring and surveillance of deviant sects (of which the Bahá’ís are implicitly categorized) and policies aimed at stifling the economic and educational progress of the Bahá’í community are also mentioned. In March a request was made to the European Union to intensify diplomatic pressure to key officials orchestrating the repression of the Bahá’í community. Under the category of violators of professional rights Major General Seyed Hassan Firouzabadi is named. In her analysis Neekoo recalls 2005 letter penned by the General outlining “a mission to acquire a comprehensive and complete report of all the activities of these sects (including political, economic, social and cultural) for the purpose of identifying all individuals of these misguided sects. Please stay tuned for further quarterly summaries and reports from 2012 and 2013. Follow the twitter hashtag #IBSOC for real-time updates and future notifications for newly reports and developments from this SOC.